Light and healthy carrot muffins made with almond flour. 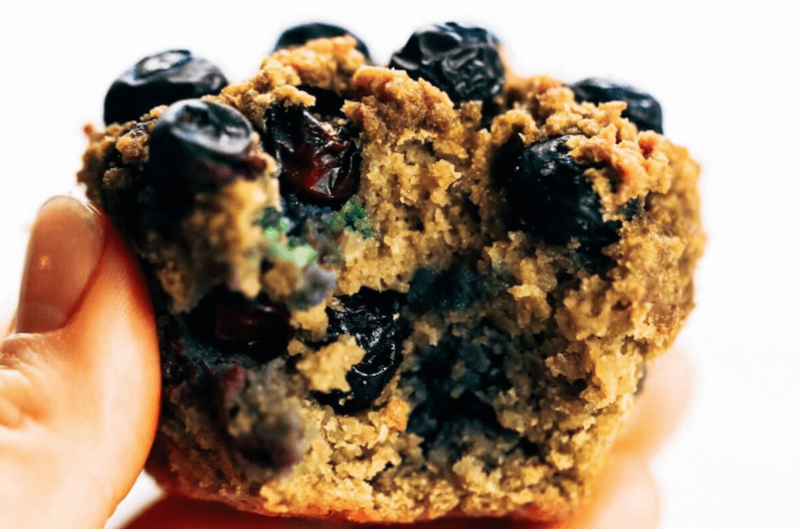 Oil-free paleo muffin recipe, packed with protein and lots of yummy orange zest flavor and spices! This easy gluten-free muffin recipe is an easy family breakfast served with a side of bacon… or not. Preheat oven to 350F and generously grease a muffin pan with coconut oil. In a bowl combine all ingredients until smooth (except carrots and raisins), then stir in grated carrots and raisins. 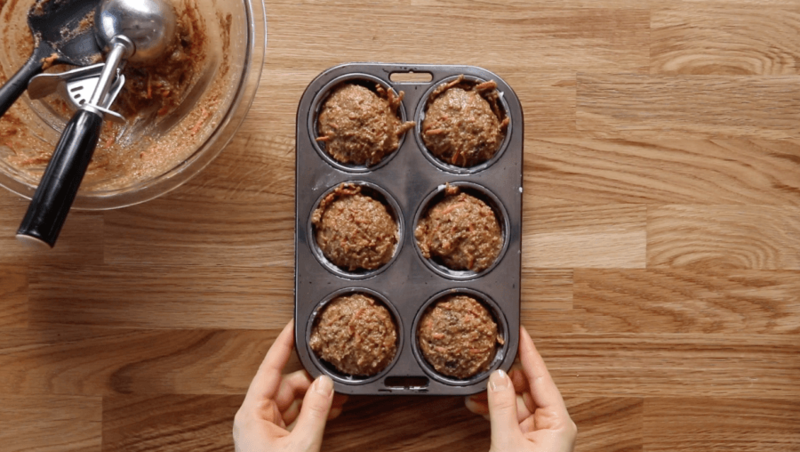 Use a large ice-cream scoop (about 1/2 cup) to fill muffin pan with batter, then bake on 350F for about 25 minutes until golden or until a toothpick when inserted into the center of a muffin comes out clean. Nutrition Facts Carrot Muffins Amount Per Serving Calories 328 Calories from Fat 162 % Daily Value* Total Fat 18g 28% Saturated Fat 2g 10% Polyunsaturated Fat 0.1g Monounsaturated Fat 0.02g Sodium 268mg 11% Potassium 123mg 4% Total Carbohydrates 36g 12% Dietary Fiber 7g 28% Sugars 23g Protein 9g 18% Vitamin A 114% Vitamin C 3% Calcium 16% Iron 8% * Percent Daily Values are based on a 2000 calorie diet. Homemade paleo pancakes. Fluffiest pancakes of your life! 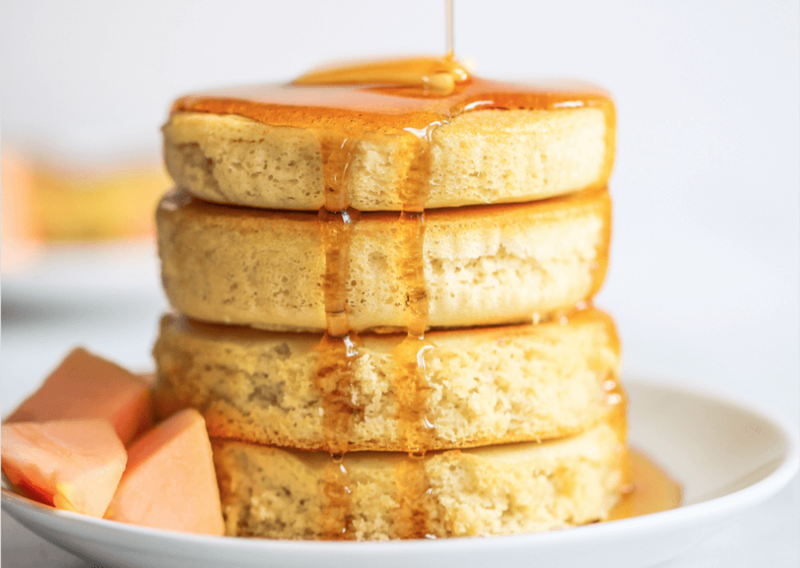 These healthy almond flour pancakes are life-changing. You won’t believe these pancakes are gluten free and paleo, they are so good and light and fluffy. 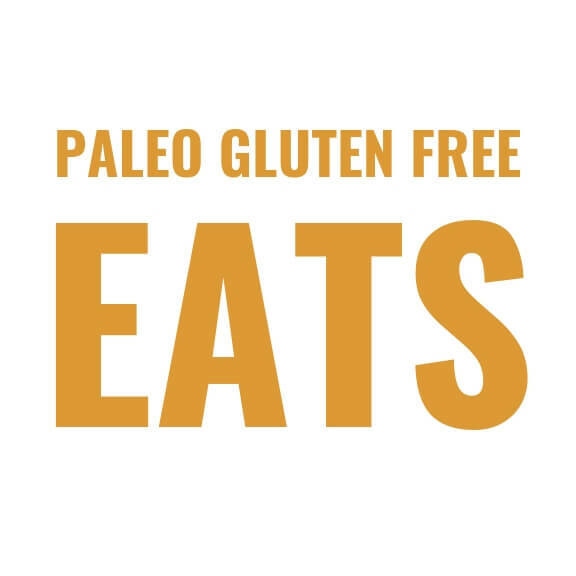 Easiest paleo pancake recipe. English Muffin Rings- Click Here! In a large mixing bowl combine all ingredients for pancakes and whisk until smooth. Heat a skillet on the stove over medium heat. Grease the edges of a few english muffin molds (link to the ones I use- in recipe notes). Set molds onto the skillet and lightly drizzle the skillet with oil. Once the skillet is heated, use a large ice-cream scoop and fill the molds, cover with a lid, and cook for 3-5 minutes until the pancakes have bubbles on the top and are mostly cooked, then flip and cook for another 1-2 minutes until fully cooked and golden. Note: you can also cook these like normal pancakes, but they won't be as fluffy and thick without the english muffin molds. Nutrition Facts Paleo Pancakes Amount Per Serving Calories 215 Calories from Fat 135 % Daily Value* Total Fat 15g 23% Saturated Fat NaNg 0% Trans Fat NaNg Polyunsaturated Fat 0.2g Monounsaturated Fat 1g Cholesterol NaNmg 0% Sodium 303mg 13% Potassium 20mg 1% Total Carbohydrates 15g 5% Dietary Fiber 3g 12% Sugars NaNg Protein 8g 16% Vitamin A 1% Vitamin C NaN% Calcium 15% Iron 8% * Percent Daily Values are based on a 2000 calorie diet. Healthy banana bread recipe made in just 5 minutes! 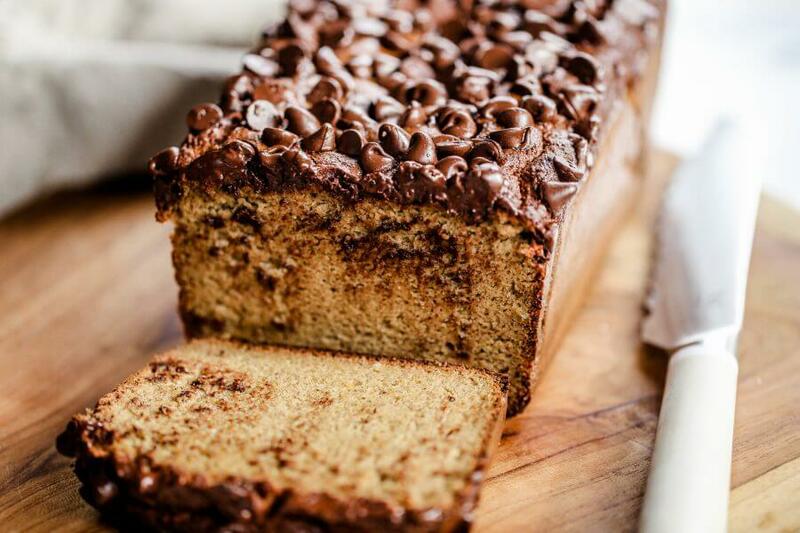 This easy paleo gluten free banana bread has a secret healthy ingredient: cauliflower! No one ever tastes it though- and all the wheat eaters love this delicious banana bread. Easy almond flour banana bread recipe. Preheat oven to 350F. Line a 8" by 4" bread pan with parchment paper. In a food processor or high powered blender, combine all ingredients (except chocolate chips) until completely smooth. Then pour batter into the bread pan lined with parchment paper. 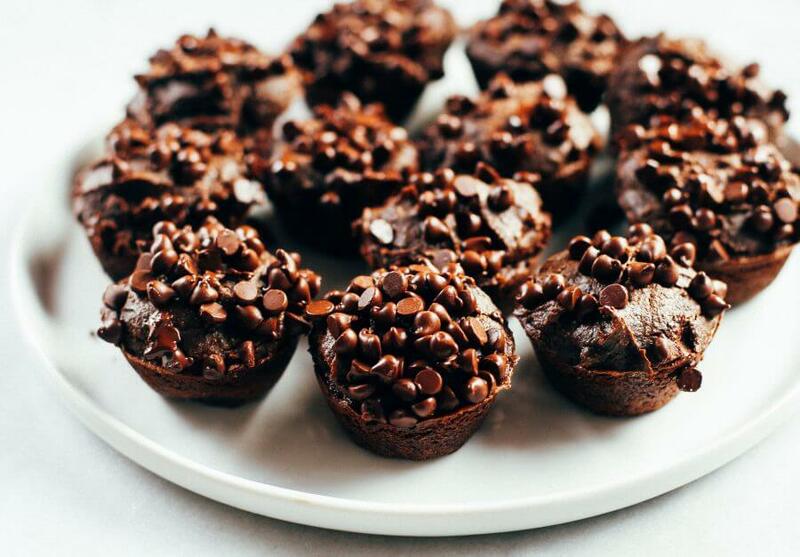 Sprinkle chocolate chips over batter and bake on 350°F for 80 minutes. Nutrition Facts Banana Bread Paleo Gluten Free Amount Per Serving Calories 296 Calories from Fat 189 % Daily Value* Total Fat 21g 32% Saturated Fat 3g 15% Polyunsaturated Fat 0.2g Monounsaturated Fat 0.4g Cholesterol 40mg 13% Sodium 212mg 9% Potassium 154mg 4% Total Carbohydrates 24g 8% Dietary Fiber 5g 20% Sugars 13g Protein 10g 20% Vitamin A 1% Vitamin C 17% Calcium 12% Iron 12% * Percent Daily Values are based on a 2000 calorie diet. Sweet potato waffles made with two ingredients and ready in just five minutes! 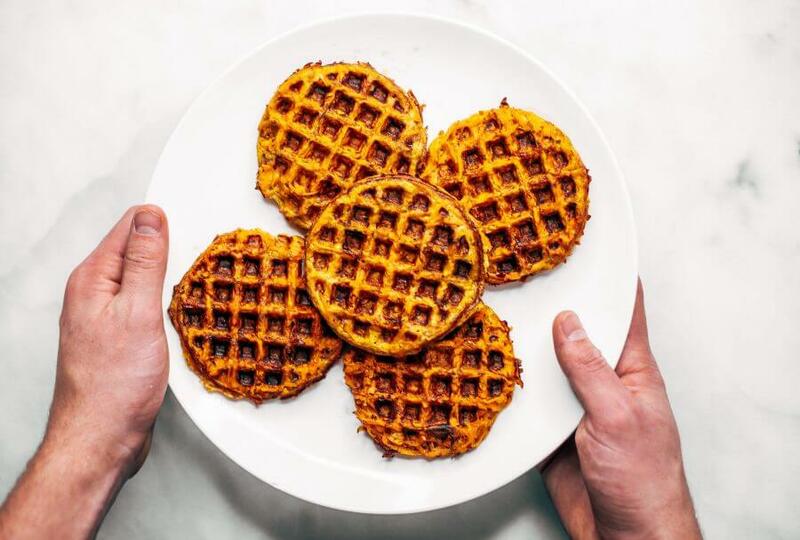 These sweet potato waffles are better than Eggos and can be made ahead and frozen for quick meal prep. 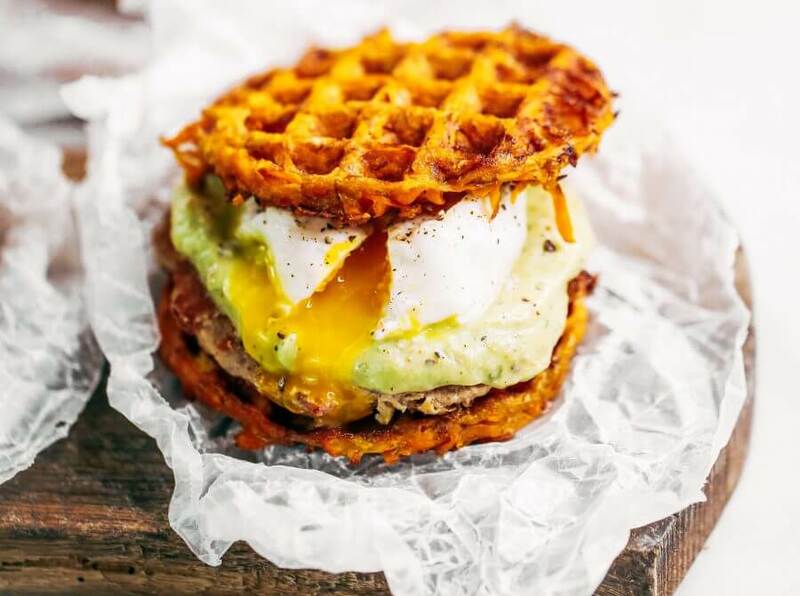 Best paleo waffles for healthy eaters. Easy gluten free waffles for everyone! This is the waffle iron I use. In a bowl whisk together grated sweet potato, eggs, and salt (optional). Heat waffle iron, then drizzle with olive oil to keep waffles from sticking. See recipe notes for the waffle iron I use. Cook waffles until golden and crispy (about 5 minutes or more) then serve with your favorite toppings- savory or sweet! Nutrition Facts Sweet Potato Paleo Waffles Amount Per Serving Calories 158 Calories from Fat 18 % Daily Value* Total Fat 2g 3% Saturated Fat 0.5g 3% Polyunsaturated Fat 0.2g Monounsaturated Fat 1g Cholesterol 62mg 21% Sodium 188mg 8% Potassium 551mg 16% Total Carbohydrates 32g 11% Dietary Fiber 5g 20% Sugars 7g Protein 4g 8% Vitamin A 449% Vitamin C 6% Calcium 6% Iron 6% * Percent Daily Values are based on a 2000 calorie diet. Easy whole30 egg and zucchini breakfast bake with tomatoes, yellow squash, herbs, and zucchini. This paleo breakfast is perfect for meal prep at the beginning of the week and paired with one of my homemade sweet potato tortillas! Slice tomatoes, zucchini, and yellow squash into 1/4" rounds and alternately layer into an 8" casserole dish. In a saucepan saute diced onion and minced garlic in a drizzling of olive oil (about 1 tablespoon) until golden. Whisk eggs and spices together, then add sautéed onions and garlic and pour over vegetables. Bake on 350F for about 50 minutes until golden on edges and the middle springs back when you push on it with your finger. 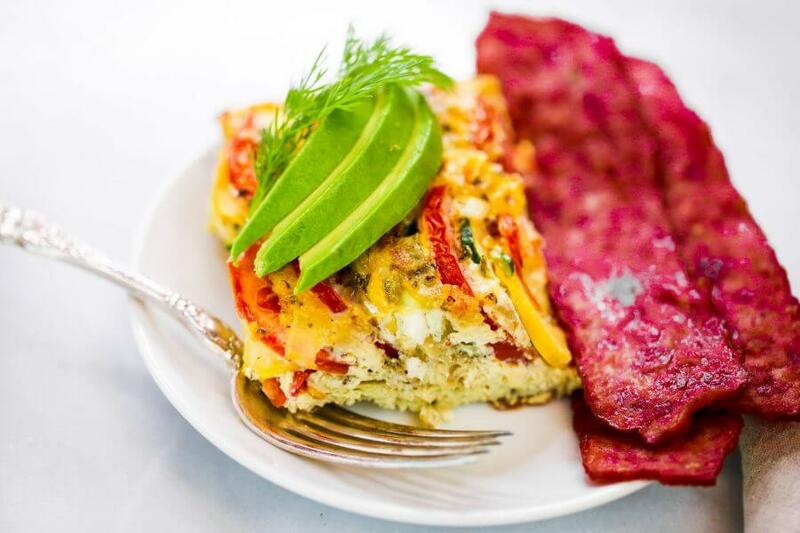 Nutrition Facts Tomato Zucchini Egg Breakfast Bake Amount Per Serving Calories 158 Calories from Fat 81 % Daily Value* Total Fat 9g 14% Saturated Fat 3g 15% Polyunsaturated Fat 1g Monounsaturated Fat 3g Cholesterol 372mg 124% Sodium 368mg 15% Potassium 336mg 10% Total Carbohydrates 7g 2% Dietary Fiber 1g 4% Sugars 4g Protein 12g 24% Vitamin A 11% Vitamin C 22% Calcium 6% Iron 9% * Percent Daily Values are based on a 2000 calorie diet. 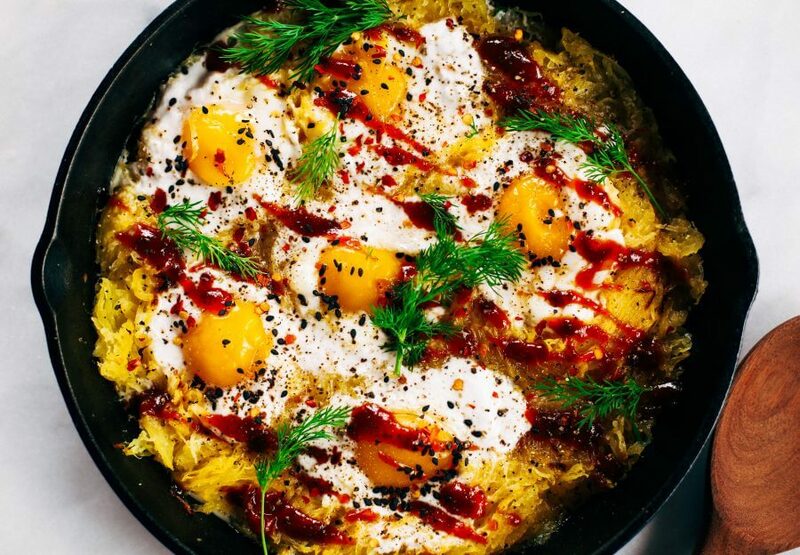 Ready for this whole30 spicy spaghetti squash egg skillet for breakfast? This easy filling breakfast skillet recipe is paleo, gluten free, and dairy free. 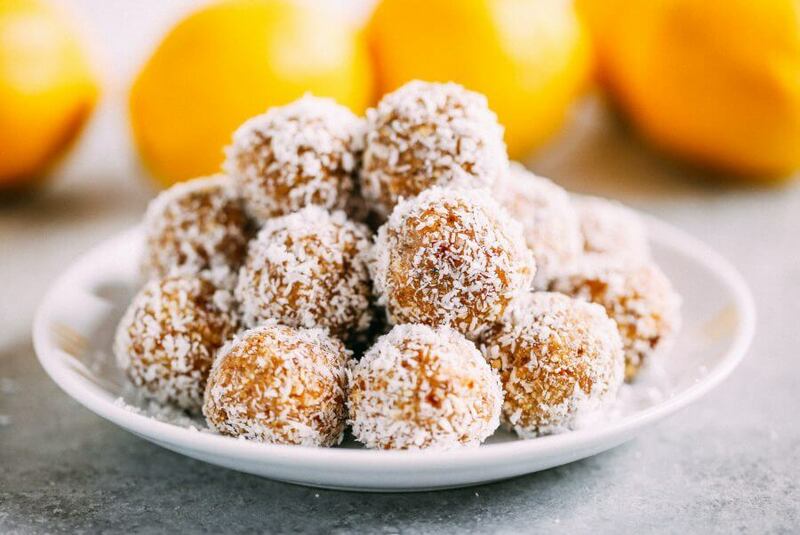 Perfect for chilly winter mornings and whole30 meal prep! How to cook spaghetti squash: cut squash in half lengthwise and lay face down on a baking tray with 1/2" water. Bake on 350F for 40 minutes (longer for softer noodles). Once cooked, use a large fork and scrape meat out for "noodles". Lightly drizzle a cast iron with olive oil. Layer cooked spaghetti squash noodles in skillet. Hollow out six holes in the spaghetti squash for the eggs. Crack eggs into the holes in the squash and broil for 5-10 minutes until eggs reach desired consistency. Top skillet with fresh dill, hot sauce, sesame seeds, and coconut milk (optional), and salt and pepper to taste. Nutrition Facts Spicy Spaghetti Squash Egg Skillet Amount Per Serving Calories 226 Calories from Fat 126 % Daily Value* Total Fat 14g 22% Saturated Fat 3g 15% Polyunsaturated Fat 3g Monounsaturated Fat 6g Cholesterol 279mg 93% Sodium 621mg 26% Potassium 430mg 12% Total Carbohydrates 17g 6% Dietary Fiber 4g 16% Sugars 7g Protein 10g 20% Vitamin A 28% Vitamin C 24% Calcium 9% Iron 13% * Percent Daily Values are based on a 2000 calorie diet.